Cartagena is a truly sensational tropical Colombian paradise and possibly my favourite city in Colombia and perhaps South America. The city of Cartagena is situated on Colombia’s northern peninsula. This makes Cartagena is South America’s perfectly located slice of the Caribbean. Because of the close proximity to the Caribbean and its coastal geography, Cartagena is home to some great beaches. If you are in search of the best beaches in Cartagena then look no further. 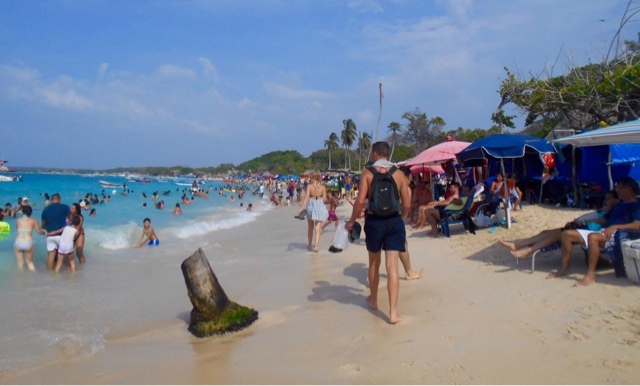 Cartagena beaches are a main attraction for tourists and during a trip to the Colombian city. Along with the beautiful Walled City of Cartegana, tourists and locals alike spend days lazing on the sands of the to main beaches in this area. Both are known to be the best beaches in Cartagena. There are two Cartagena beaches. 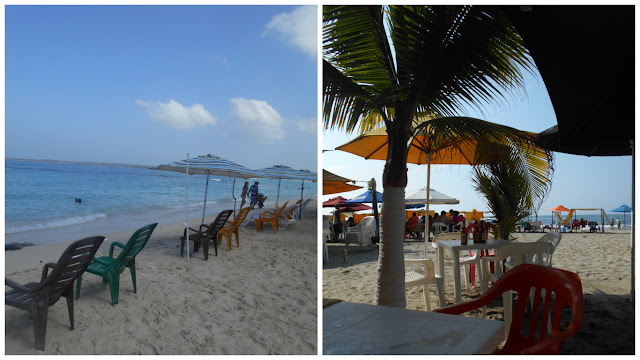 Playa Bocagrande and Playa Blanca, they are both in the same city, but they are both starkly different. 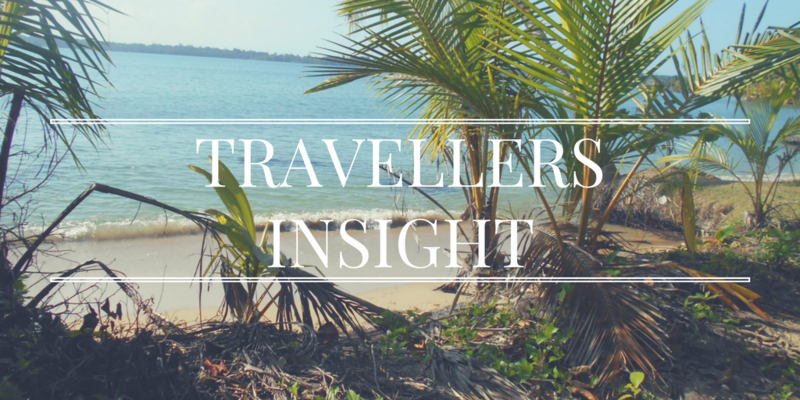 Here’s a quick review of those Cartagena beaches. Playa Blanca in Isla Baru is the first beach of Cartagena I visited. It was instantly recommended to me upon arriving in Cartagena from Panama City and a clear tourist favourite. You can choose to take public transport over the costly tours available outside The Old City. I was sold on Playa Blanca due to it’s pristine blue waters and white sands. I’d been quoted a Caribbean paradise and was keen to experience it first during my stay in the city of Cartagena. Isla Baru isn’t exaclty in Cartagena despite this being one of the best beaches of Cartagena. It’s located just outside but as mentioned above is acessible by both bus and boat as part of a tour. We boarded the shuttle bus to Playa Blanca from Calle Media Luna the main street in the Getsemani district of Cartagena. Buses leave throughout the morning but it is recommended to check times at the hostels on Calle Media Luna. Isla Baru is an island connected by suspension bridge to the mainland and city of Cartagena, Colombia. This area, and Isla Baru classed as part of the Parque Nacional Natural Corales del Rosario y San Bernardo. But I’m not sure Playa Blanca officially sits in the national park. Take note, because you do have to pay entrance fees as with most national parks in Central and South America. Other than the entrance fee to the park and our bus ticket there are no additional costs associated with taking public transport to Playa Blanca beach. Playa Blanca is an odd place. It isn’t at all the relaxing beach and island paradise the tourist information centres sell you. In fact, it’s probably the exact opposite to relaxing, but don’t let that put you off as the views do live up to the description. Playa Blanca is a hectic crowded beach with a receding shoreline. The beach itself has the whitest sand and clearest crystal blue waters imaginable. Although sold as a island paradise isn’t a very well kept secret in Cartagena. There are an incredible amount of tourists that visit this beach everyday and that is a slight threat to the picturesque shores of Playa Blanca. At times throughout the day the water is un-swimmable. The tourist tour boats and jet skis fill the shallows and make entering the water almost impossible at times so be careful. The masses tend to arrive in the morning but this trend continues throughout the afternoon. I can only speak for peak season when I say this, as I visited this Cartagena beach in December during Christmas. 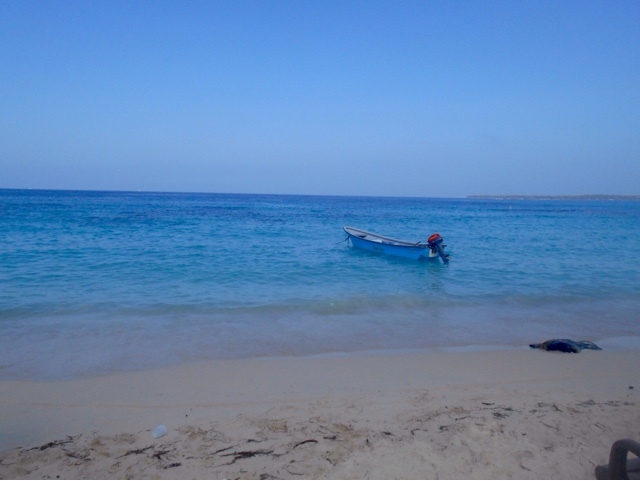 Perhaps Playa Blanca is less crowded during the slower tourism months. Or maybe it was only once an area of uninhabited national park. I did take a second trip to Playa Blanca by boat but would recommend the bus option instead as it is far cheaper, safer and less of a tourist trap. From clear blue waters and white sandy Caribbean shores filled with tourists to the concrete and grey Bocagrande (also filled with people). Cartagena beaches couldn’t be more contrasting. The second beach of Cartagena we visited was the Bocagrande. Here large tower blocks shade the promenade which runs the length of the beach. As equally as crowded and busy as Playa Blanca, Playa Bocagrande is less attractive and less expensive. However, Bocagrande is 100% authentic Colombian. The residents of Cartagena, Colombia spend their afternoons at the beach eating and drinking. We noticed many families eating in the popular restaurants that line the back of Bocagrande beach. This authenticity makes Playa Bocagrande one of the best beaches in Cartagena. It’s easy and free to visit the Bocagrande for a quick swim and sunbathe but don’t expect any picturesque photos. The bus costs $1 and runs the length of Playa Bocagrande from The Walled City of Cartagena’s Old Town. The route back takes a slight detour through the blocks of apartments, malls and fast food style restaurants. It is also quite a pleasant walk from the historic centre of Cartagena to the beach, but try to stay out of the hot midday sun. On a side note, there’s also a large shopping mall just by Playa Bocagrande for anyone looking to shop. We visited a couple of times just to take advantage of the clean toilets and cool air con. Some people have, in the past, described Playa Bocagrande hellish. But I like to think of this rough and ready area of Cartagena an exciting and truly Latin experience. We spent a lot of days around the Bocagrande area of Cartagena sampling the local beverages and saving money on the grey sands. There are more beaches in Cartagena you can visit, but from my time in Cartagena these two were simply the most popular and spoken about. 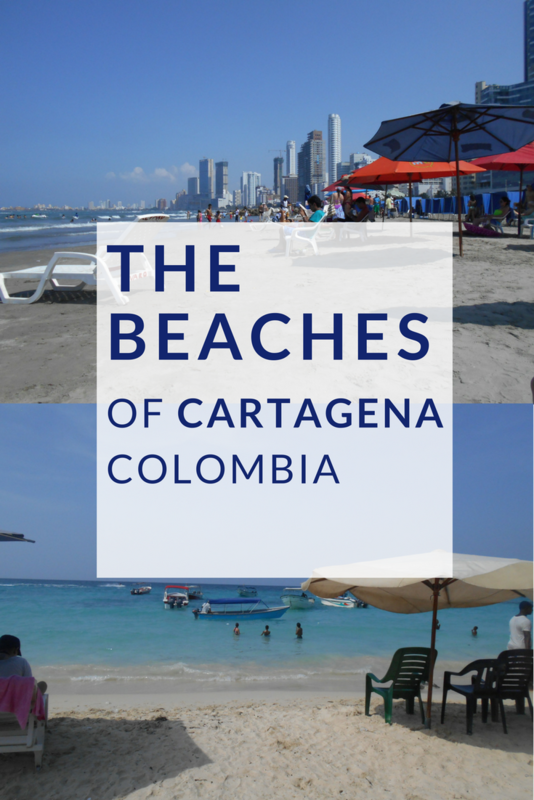 Both of the beaches reviewed above are part of the fabric of Cartagena and both had pros and cons. You only need to head over to TripAdvisor to read some of these opinions. However, Colombia, like most of Latin America, is a country that requires a little patience. Because of this I would say both of the beaches in Cartagena also require a little patience and open mindedness too.